Long before the indigenous people of southeastern North America encountered Europeans and Africans, they established communities with clear social and political hierarchies and rich cultural traditions. Historian Gregory D. Smithers brings the world of Native southerners to life in this sweeping narrative of American Indian history in the Southeast from the time before European colonialism to the Trail of Tears and beyond. 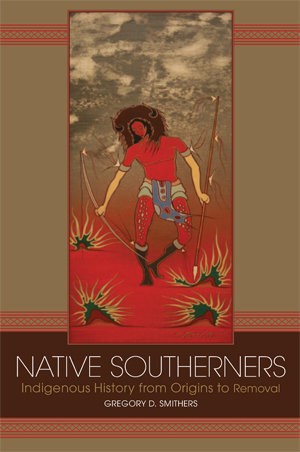 Spanning territory reaching from modern-day Louisiana and Arkansas to the Atlantic coast, Native Southerners focuses on the stories of the Cherokees, Creeks, Seminoles, Creeks, Chickasaws, and Choctaws, as well as smaller Native communities like the Nottoways, Occaneechis, Haliwa-Saponis, Catawbas, and Caddos. In Native Southerners, Smithers constructs a vibrant history of the societies, cultures, and people that made and remade the Native South. Dr. Gregory D. Smithers, an associate professor of history at Virginia Commonwealth University, specializes in Native American history. He is the author of The Cherokee Diaspora: An Indigenous History of Migration, Resettlement, and Identity and Native Southerners: Indigenous History from Origins to Removal. Can't make it to the Banner Lecture? Watch it live on the Virginia Museum of History & Culture Facebook page starting at noon. Tell your friends to tune in and don't forget to say hello and tell us where you are watching from in the comments section during broadcast.